Sunday morning was possibly the brightest and warmest day of the year so far, shirt sleeves and shorts were almost mandatory in the near sub-continent climate. I didn't get out as early as planned, yes you have guessed it too much alcohol the night before.......again! However, it was still a pretty early start, I was armed with fully recharged camera batteries and loads of blank memory cards, I was going to make the most of the brilliant light levels and get loads of cracking owl images..........yeah righto! My owl prowl wasn't really going to plan after the first two hours and 6 different sites visited, only 1 owl was seen, and that was too far away for an image! Things had a turn for the better late morning though as the resident pair at my site No 92 were out sunning themselves in their nest tree. Due to how many branches were obscuring the second bird an image was impossible. And this image (below) was only possible with the aid of a bit of flash fill, the branches above the owl were causing some horrid heavy shadows. My run of owl sightings continued to improve when the male owl at my site No 34 was located perched in nice light on a hedgerow. Cracking colours and a nicely diffused background add to the overall ambiance of this image, shame it was a too far away to pick out a bit more detail. Whilst watching the "hedgerow" owl I could hear another owl calling from not too far away, presumably it was his mate? But then things got confusing, the hedgerow owl flew to a nearby tree to join his already perched up mate!!?? 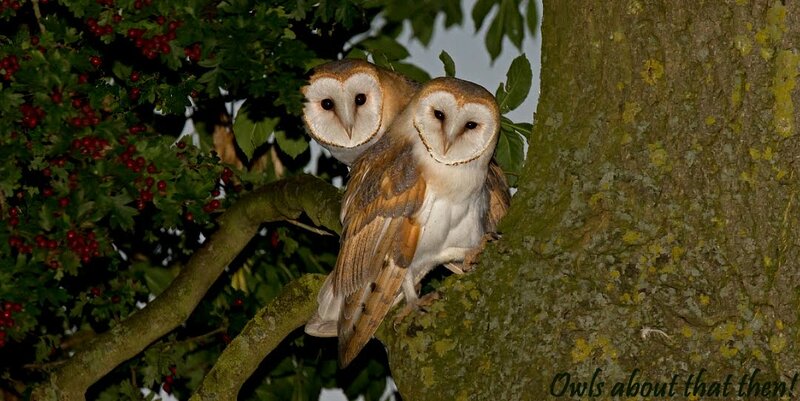 As I grabbed an image of the pair (below) I could still hear another owl calling? Luckily the group of trees where the calling was coming from was right next to the road, this allowed me the relative obscurity of the Landrover as I slowly drove towards them. 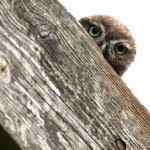 I pulled up, poked my head out of the window and directly above me was a pair of Little Owls!!! Due to the angles, height and obscuring branches involved it was terribly difficult to get a decent image. I couldn't hang around either because if things weren't tough enough I'd pulled up in the middle of the road and on a blind bend! I was just about to fire off a few images when "pap pap" oh dam a car wanted to get by! As I pulled over to let the car behind me by I noticed a grass verge that was just about wide enough for me to park on, OK it was time to put plan B into action. I drove up the lane until a turning point was located, turned around and went back. A bit of shunting back and forth and loads of engine revving but I was on the verge, surely all the noise would have spooked the birds away? I tentatively peered out of the window and the owls were still there!! So after all that fuss and commotion I finally got my first image of the owls at my NEW SITE No 205!!! Whilst with my new owls I managed to grab a quick video of them, loads of distracting background noise with passing cars and an overhead microlight, but at 18 seconds playtime you can actually hear the owls calling at the nearby site No 35, but you will need to turn up your volume! To summarise, it just goes to show how close neighbouring Little Owl territories can be. If all the necessary requirements are there, ie nest site, food source etc they will tolerate each other. I wonder how many other sites I may have missed because of the close proximity of two territories? Annoying, those 'people' who want to get past aren't they! I look at them in the rearview mirror with distain pouring from my eyes. Anyway, cracking images and a very interesting account of neighbouring territories. Oh you have met those kind of people too have you Christian, you'd think they would understand the importance of owl watching and go a different way! That's amazing Paul! Love that last image!! Cheers Richard, I suppose they are ok, much better to come hopefully, that is if the owl gods are smiling on me! Love the photos. It is nice to see that others share my love for wildlife...especially birds. Thank you.